Jim Leeke’s engaging and informative historical account of the impact of World War I on the world of baseball, From the Dugouts to the Trenches: Baseball During the Great War, published by University of Nebraska Press, has earned the 2018 Larry Ritter Book Award. The award is granted annually by SABR's Deadball Era Committee to the author of the best book about baseball between 1901 and 1919 published during the previous calendar year. The winner’s work must demonstrate original research or analysis, a fresh perspective, compelling thesis, impressive insight, accuracy, and clear, graceful prose. Meticulously researched, engaging, and well written, From the Dugouts to the Trenches opens with American League President Ban Johnson’s attempts to embellish Organized Baseball’s patriotism and preparedness as America entered the Great War in 1917, nearly three years after it ignited in Europe. Johnson persuaded the teams in his league, and even some in the rival National League, to engage in military drill exercises, brandishing baseball bats rather than rifles, a quaint practice not embraced by all players. As 1917 unfolded, the effects of the war became less ceremonial and more material, as players left the major and minor leagues to serve in the military. Boston Braves catcher Hank Gowdy was among the first to enlist, while Washington Senators owner Clark Griffith initiated a fund-raising program to buy baseball gear for doughboys serving “over there” on the front lines in France. By 1918, the impact of the Great War was acutely felt by baseball. In June, Provost Marshall General Enoch Crowder, the director of the military draft, decreed that all draft-eligible young men must be employed in an occupation essential to the war effort by July 1, or be subject to the draft. Despite efforts by some owners, Organized Baseball was not exempted from the “Work or Fight” order. Although the deadline for baseball was eventually extended, players continued to enlist or were drafted, and more than 1,200 served in uniform before the conflict’s end. Scores more went to work at steel factories and ship building dockyards, and some represented their companies in industrial leagues that rivaled the major leagues. Leeke tells how team owners, including Chicago White Sox magnate Charles Comiskey, openly questioned the patriotism of the players who chose to work (and play) rather than fight, including his star slugger Shoeless Joe Jackson, who played for a shipyard team. Leeke chronicles the challenges to Organized Baseball, as able-bodied young men served in the armed forces or vital service industries. Most minor leagues folded or suspended operations early in 1918, and the major leagues shortened their schedules to finish more than a month early. After the Boston Red Sox defeated the Chicago Cubs in the World Series in September, team owners released their players to serve or work. The 1919 season was in doubt and the future of Organized Baseball appeared to be in great peril. But in November, with news of a war-ending armistice, owners began to make plans for the 1919 season, and players started to return to their teams. While most continued their careers with minimal interruption, Leeke tells the story of Christy Mathewson and Grover Cleveland Alexander, who were permanently impacted, and of a small number, including former New York Giants infielder Eddie Grant, who were killed in the war. It is these individual stories of owners, players, and sportswriters who served in uniform at the battlefront and in coveralls on the home front during the Great War that makes Leeke’s work so impactful. Using a variety of contemporary sources, including the military periodical Stars and Stripes, the U.S. Navy veteran brings these century-old stories to life. Leeke’s own story is also compelling. After his Navy experience and journalism school at Ohio State University on the GI Bill, he worked as a reporter, columnist, and sportswriter, and covered major league baseball for a suburban daily newspaper in Northern California. He now resides in Columbus, Ohio, and works in communications and advertising with clients across North America and worldwide. 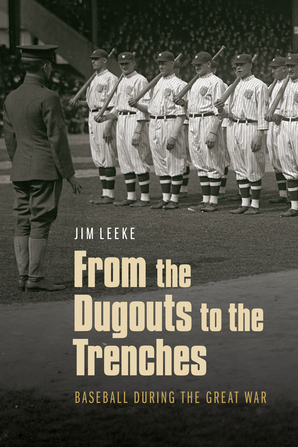 From the Dugouts to the Trenches is Leeke’s third book to be nominated for the Larry Ritter Award. Nine Innings for the King: The Day Wartime London Stopped for Baseball, July 4, 1918 and Ballplayers in the Great War: Newspaper Accounts of Major Leaguers in World War I Military Service were considered in previous years. Leeke is an active SABR member and has written a number of Deadball Era biographies. Conferred annually since 2002, this year’s Ritter Award will be formally presented to Jim Leeke at the DEC meeting at SABR 48 in Pittsburgh. The winner was selected by the Larry Ritter Book Award Committee chaired by Doug Skipper, with members Mark Dugo, David Fleitz, Ben Klein, Craig Lammers, John McMurray, and Mark Pattison. This page was last updated April 16, 2018 at 2:05 pm MST.